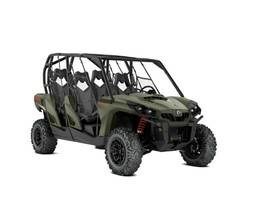 2019 Can-Am® Commander™ MAX DPS™ 800R 4 SEATS RESPOND FOR YOUR EVERY MOVE Put yourself behind the wheel of Can-Am's versatile side-by-side equipped with Tri-Mode Dynamic Power Steering (DPS) for the control when tackling off-road routes everywhere—and bring along 3 passengers. Features may include Rotax V-Twin engine PERFORMANCE DEFINED Take command of a thrilling 71 horsepower Rotax® 800R liquid-cooled V-Twin engine with four valves per cylinder and single overhead camshafts featuring twin fuel injectors that optimize fuel delivery into the combustion chamber for powerful, yet precise performance Comfortable seating for four ROOM TO ROAM You'll enjoy ample seating for all passengers, with a generous 106.1 in. (269.4 cm) wheelbase. There's grip where it counts too, with individual handholds for all passengers—no shared grab bars here. Tri-mode Dynamic Power Steering (DPS) HANDLING WITH PRECISION Three (3) levels of rider-adjustable steering assistance give DPS models the ability to adapt steering feel to match the terrain while also reducing kickback. The amount of assistance varies with speed, adjusting input naturally and only as much as needed. Intelligent Throttle Control (ITC) READY TO DANCE The Can-Am Intelligent Throttle Control (ITC) throttle-by-wire system ensures smooth power delivery via precise control of its 54 mm Bosch† throttle body—even if the driver's foot is bouncing due to rough terrain. ITC detects unwanted bounces and filters the input, with selectable progressive and Sport modes. Torsional Trailing arm Independent (TTI) rear suspension STAY IN CONTACT You're looking at the only independent rear suspension that eliminates scrub and camber changes, meaning the wheels pivot up and down rather than in a butterfly motion. This ensures the vehicle moves only in the direction you point it. Reconfigured for improved traction and optimal transfer of power to the ground.